But enjoying a relationship with Jesus is another thing altogether, kinda like the difference between “being a good husband” and “being in love with your wife.” One follows the other, but to frame the thing in terms of “being a good husband” seems to miss the point altogether. For those who have been wondering, the outreach to DC was powerful and intense. We partnered with Justice House of Prayer and YWAM DC, interceding in various locations over such issues as justice, compassion, the sanctity of life, government, and the strongholds at work within our nations capitol. It was a rare treat to partner with young people who are committed to praying until the mountains of injustice are moved. 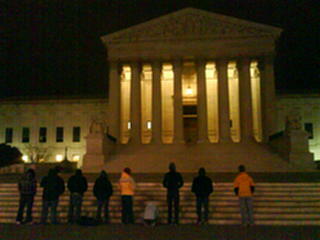 Midnight prayer watch at the Supreme Court. particularly the part that says, “take hold of the life that is truly life”. Can’t say I really hear too many people talk about “living the Christian life”, but I can sure tell you I want to live the life that is truly life which is only lived in Him. Hope all is well. Any idea yet what you will be doing next? Do you know Jim Ehrman from YWAM (a little while way)? He’s teaching my class on missions theology right now. Thanks for this post. A life of rule, is hardly much of a life at all. I would deeply appreciate your comments on my posts. thanks.